For this installment of the 30K check I will take a little different approach. Instead of looking at older Supercars that need a lot of homework and maintenance, we will look at a somewhat newer car that has a reputation of being quite bulletproof. I give you the Lotus Elise. The Elise was introduced in Europe in 1996, but did not make it to the states for another 9 years. Originally it had a 118 hp Rover 1.8 litre engine but because of its light weight could crack off 0-60 times in the sub 6 second range. Due to tightening European emissions and crash standards, and the looming US launch, Lotus teamed with General Motors and Toyota to put the wheels in motion to secure the Lotus Elise as one of the best bangs for the buck the US had seen in a long time. In 2005, The US version Lotus Elise, with an updated US Emissions legal Toyota 1.8 Litre D.O.H.C. engine sporting a Yamaha Designed head and valve train laid down 189 Horse Power. That is the same horse power that a Chrysler Sebring 2.7 litre V6 was rated for the same model year! But tipping the scales at a mere 1,896 lbs, this was a cute little car with a very powerful mean side. It made the Sebring feel like a four ton, mid 70’s American luxury car. The Elise embodied the very principal that Lotus Cars was founded on. Light weight, with sufficient power. It was David, Going out looking for Goliath! In January of 2006, at the Los Angeles Auto Show, Lotus Cars unveiled a fixed roof coupe version that would be imported to the USA known as the Exige. One month later, in February 2006, Lotus announced a Super charged version producing 220 horse power would also be crossing the pond. This car would simply be known as the Exige S. But these cars have not quite reached our 30K price point yet so we will save them for a future day. 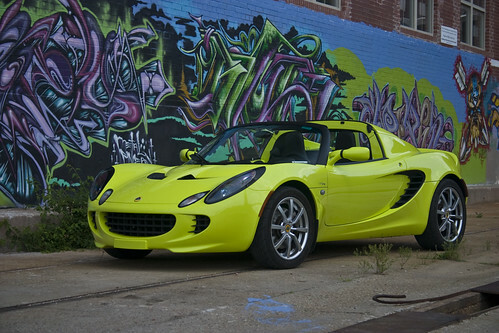 The Lotus Elise listed for 42,995 in 2005, and if you showed up to order one, and you wanted to go over options, about the only decision you would be faced with was what color to get. Most Elises’ were ordered for light recreation and track day duty with some owners actually choosing to use them as daily drivers. They must have had stronger kidneys than me. This is more like a street legal go kart than a serious road car. The Elise is what I like to refer to as a Friday car. One that I do not think I could live with daily driving, but as the work week winds down, and Friday approaches, while most of my coworkers are enjoying dressing down on casual Friday to get the spirit of the weekend started early. I enjoy the commute to and from work by rewarding myself with an amusement park ride to and from the office. Many Friday cars have passed through my stable, but the Elise would be a welcome addition to our clan. Today these cars are available in large numbers which makes finding a nice clean one fairly easy. I would not shy away from a track car as long as it has been maintained and up kept. The Toyota running gear has stood the test of time and appears to be, for the most part, without fault. Watch Carfax and other VIN check sites to find collision damage as track cars sometimes have a tendency to go off road. The parts availability is excellent considering you are looking at a low volume race car that is assembled in a small Norfolk England Farm house. And finally, it would not be CAM if I could not tell you about the aftermarket support of these cars. Many aftermarket suppliers have jumped on the Elise and Exige band wagon including such heavy hitters as Cosworth, H&R, Brembo, and Koni to name a few. Don’t hold back, go chase your exotic British car down and enjoy, just plan time whenever you stop to get gas to answer question and talk to enthusiast who flock around the car as this little giant killer has huge “Maverik Factor” going on.